Plastica de Argila - Revitalizing Shampoo 250ml Shampoo enriched with hyaluronic acid to clean and nourish the hair. How to use: apply on wet hair and massage. Rinse and repeat if required. Plastica de Argila - Clay Mask 200ml Mask rich in hyaluronic acid and organic silica, rejuvenates the hair promoting maximum nutrition. How to use: after aplying the Revitalizing Shampoo, rinse the hair, retire the excess of water and apply the product over the entire lenght of the hair. Massage section by section from roots to ends and leave for 5 minutes. Rinse. Plastica de Argila - Finishing Fluid 90ml Restores and seals the cuticles. How to use: spread a small quantity of the fluid through your dry or damp hair, and style as usual. Detoxifies the scalp, preparing the area for the growth of strong and resistant hair. Removes impurities from the hair, promoting healthier, shinier hair. 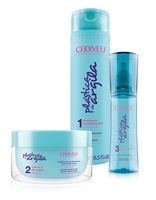 Free of silicones, nourishes from root to tips, leaving no residue. Protects the hair from the astringent action of the shampoo. Intensely nourishes the hair fiber, leaving no residue. Eliminates oiliness and flaking of the scalp. Promotes cell renewal, strengthens and brings shine to the hair. Ensures nutrition and increased softness to the hair, without weighing it down. Makes the hair strong and resistant to breakage. Apply Detox Hair Protein to dry hair, length and tips, in sufficient amount to moisten the strands. Leave in for 10 minutes before shampooing. Dilute 2 caps full of Detox Shampoo with a cup of water to allow proper distribution of product, leaving no residues. Apply to scalp and massage with fingertips. Rinse thoroughly and repeat if necessary. Apply Detox Conditioner to length and ends of hair, avoiding the scalp. Massage strand by strand. Leave in for 2 minutes. Rinse thoroughly. Style as desired. To extend the life of your smoothing treatment we recommend using our Home Care. Nourished and frizz free hair. Cabello nutrido y libre de frizz. Extremely soft, disciplined and strengthens hair. Cabello extremadamente suave, disciplinado y fortalecido. Heat protector, restores hair strands, anti-breakage, anti-frizz and prolongs smoothing effect. Protector termico, reestructurador de la hebra capilar, antiquiebre, antifrizz y prolonga el efecto liso.